Unlike our residential solar water heating package, commercial solar heating systems require much larger storage capacity. The water tank is like a battery in a PV system. It harnesses the energy to be used when demanded. Without a solar storage tank the energy would need to be used instantly as it is produced. In some applications this is feasible but for most, the supply and demand don't equally match. This is where the solar storage tank fits in. Unlike battery energy, heat energy is hard to store. The only way to properly store it is in a well-insulated tank. We use the most advanced heat storage tanks for our prepackaged commercial solar heating systems. 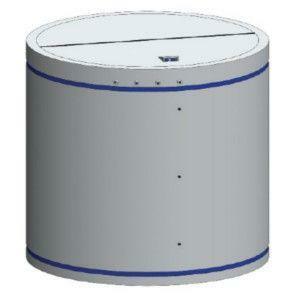 These tanks have many features that make them ideal for solar storage applications. High Insulation Value with 1 degree of heat loss per day. Thickly insulated barrel-shaped tank in aluminum sheeting, With sizes starting at 120 Gallons to 5000 Gallons, our large commercial solar storage tanks have the advantage of going through any size door as they ship on a pallet just 19” wide x 53” high. This is very important as access to boiler rooms makes installing larger commercial solar tanks difficult if not impossible. Even more amazing is our solar storage tanks can be assembled within an hour from uncrating! These tanks are open to atmospheric pressure and as such don’t require ASME certification that increase the cost by nearly 500%. The tanks can be fitted with any number of through ports that connect to your piping via a 1” FPT fitting. In an open loop configuration solar water is drawn in from the bottom port and hot returning water is returned in the upper port. This means the top layer is always the hottest. 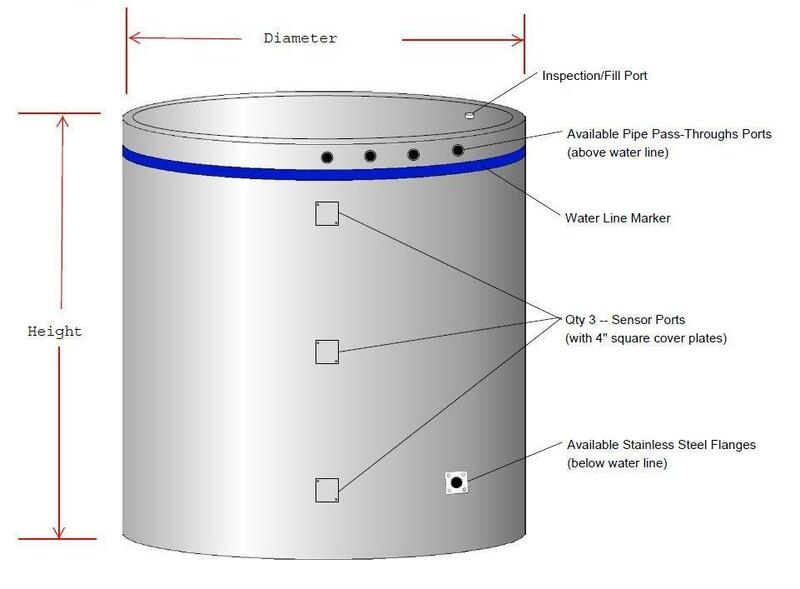 This stratification allows the system to deliver results even when the entire tank is not fully loaded. The larger the solar storage tank the more energy can be stored! 3 fitting positions are included for thermal sensor at top, middle and bottom. This allows solar controllers such as the RESOL BS/+ and the advanced MX controller to manage the system through their differential controllers. While the our commercial tanks can be used in open loops it is most common in colder climates to use a heat exchangers and run glycol heating fluid, this prevents any damage should freezing occur. 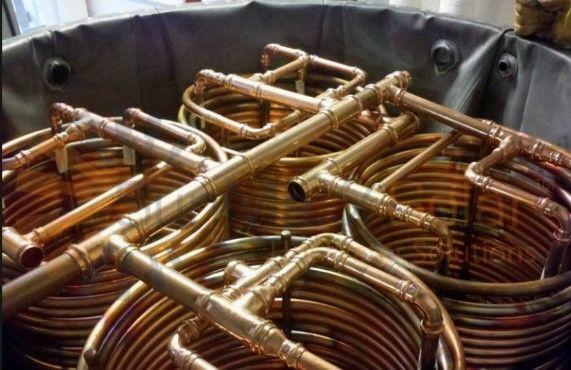 Our commercial tanks come with many optional heat exchanger sizes and are all made from ¾” copper piping in a vertical spiral configuration. 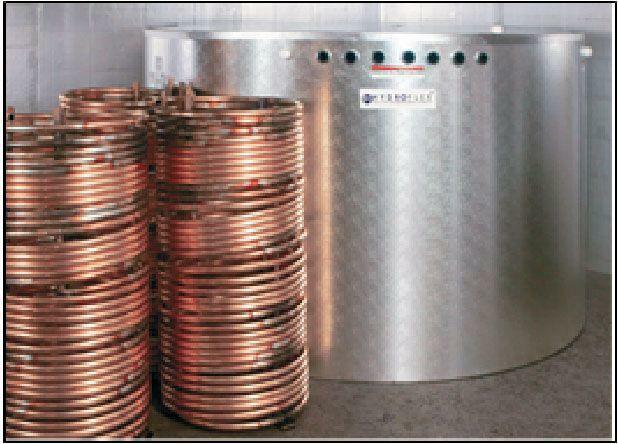 One set of coils is used to distribute heat to the storage tank and the other is used to remove heat energy to supply a demand side load such as space heating, domestic hot water, or pool and hot tubs. In this way the tank buffers the solar energy and then delivers it as needed. 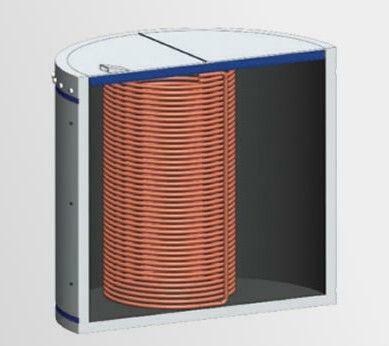 The internal heat exchangers are module and can be added together to form larger heat exchanger capacities for larger commercial solar thermal systems. Total capacity is of heat transfer depends on size of tank and number of heat exchangers internally. We help you with the design and size so just give us a call to discuss 1 800 317 9054.